On The Science Horizon: MIDSCI offers Quality and Affordability with new Saliva Kits! MIDSCI offers Quality and Affordability with new Saliva Kits! Did you know MIDSCI now carries Genefix Saliva kits? Besides a more affordable, yet high quality option, how do our Saliva kits compare to others on the market? Check it out below and please contact us with any questions! Genefix Saliva Collectors from MIDSCI contain the stabilization buffer in the tube, allowing for rapid sample stabilization that is maintained at room temperature for at least 12 months. 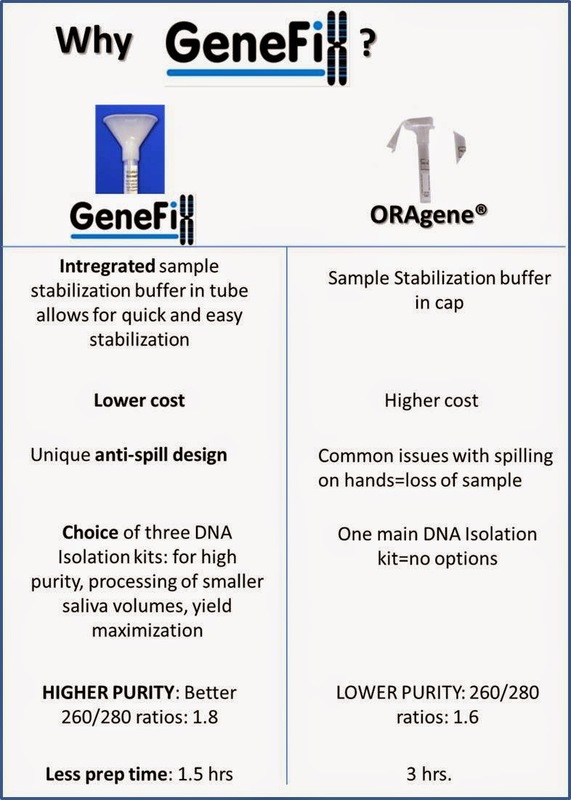 The unique funnel design means no buffer flow back or spillages and the easy to use design allows for use in the field, at home, or clinic based sampling. The collection tube, certified to 95 kPa, allows for leak-proof mailing. Saliva DNA Isolation kits are available in both column based and buffer (no column based kits) allowing for both manual and high throughput isolation applications. Want to see the results for yourself? Contact us for a sample or to purchase a kit at custserv@midsci.com. For any technical questions, please feel free to e-mail elise.ambrose@midsci.com.